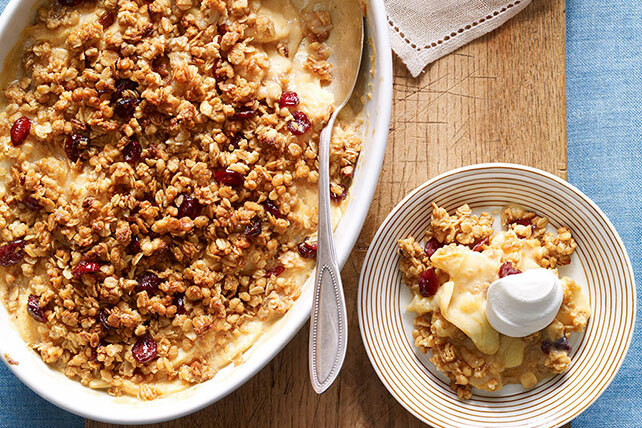 Try our Apple Crisp Recipe for a tasty treat that's ready in no-time—thanks to instant vanilla pudding and a cranberry-pecan granola mix! Toss apples with next 3 ingredients in large bowl. Stir in water; spoon into 1-1/2-qt. baking dish. Microwave butter in medium microwaveable bowl on HIGH 30 sec. or until melted. Stir in granola; spoon over apple mixture. Bake 50 min. or until apples are tender. Prepare using 1 pkg. (3.4 oz.) JELL-O Vanilla Flavor Instant Pudding.